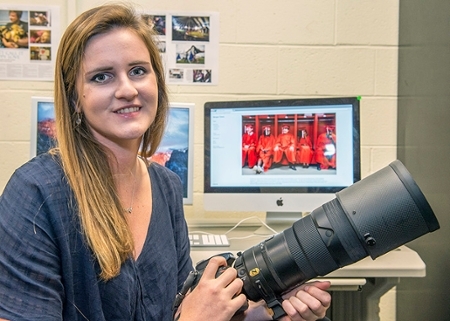 For Southern Illinois University Carbondale senior Morgan Timms, photojournalism blends adventure, creativity and research, and is the perfect vehicle to reach and inspire people. Timms was selected by the College of Mass Communication and Media Arts to receive a 2017 Pulitzer Center on Crisis Reporting International Reporting Fellowship. Once she graduates in May with a double major in psychology and photojournalism, Timms will return to her native Australia for several weeks to document the role of cultural identity in the health and well-being of Aboriginal youth. Timms, who is from Brisbane, Australia, will stay in a community that has one of the highest rates of youth suicide in the world, and document her experiences there over two weeks. “That really broke my heart a bit when I heard that (suicide rates), so I was really motivated to let people know about it. I think it is a global issue and something that needs an international audience,” she said. “I’m overwhelmingly grateful for the support of SIU and the Pulitzer Center. I’m so lucky to be afforded this opportunity,” said Timms, the daughter of Melissa Donaldson and Geoff Timms of Brisbane, Australia. The partnership with the Pulitzer Center on Crisis Reporting gives students the opportunity to report on global issues through reporting fellowships. The university’s School of Journalism has been part of the center’s Campus Consortium since the launch in January 2009, but the relationship between the center and SIU students goes back farther with William Freivogel, a journalism professor and a member of the center’s advisory committee. There are 30 universities and community colleges in the consortium, and Timms will be the 10th SIU student to participate. Another student, Ryan Michalesko, a junior from Carbondale majoring in photojournalism, will use his fellowship to spend time in Mexico telling the story of migrants who travel to the United States for seasonal work. A three-time Missouri Valley Conference Scholar-Athlete as a swimmer in the backstroke, Timms also found time to work as the photo and video editor at the Daily Egyptian, the student newspaper on campus. Since her NCAA eligibility ran out in February 2016, she is helping with the swim team this season. Timms said at SIU she found a family through the swim team and her passion in visual storytelling. She was initially a psychology major, but became hooked after taking her first basic photojournalism class with Phil Greer, a senior lecturer in the School of Journalism. Timms said being recruited to swim for the Salukis opened up many doors -- being able to see the world, and her love of photojournalism. She still enjoys psychology and finds it interesting, so she is continuing with those studies. While he describes her as “low-key,” Greer points to Timms’ passion for work. She interned last summer for a suburban Chicago newspaper and they were sufficiently impressed that they want to open up similar opportunities for other students, Greer said. You can read all of our newsletters here.